Meet the VETSS family, and learn more about our modern veterinary facility in Charlottesville, Virginia. VETSS has served Charlottesville and the surrounding communities since 1989. We are the region’s only 24 hour emergency animal clinic. In 2018, we began providing general wellness checkups and vaccines during normal business hours. We primarily care for cats and dogs, but are willing to help any animal in need. We believe in care for all animals, and partner with numerous community groups to care for animals that have been abandoned, neglected, abused, or lost. We partner with many local nonprofit animal care organizations to provide shelter, rehabilitation, and new lives for animals in need (Click below to learn more). We proudly support our local military, veterans, police, first responders, and seniors with a 10 percent discount. We are bronze level sponsors of the annual 4 Our Freedom 5k. Our equipment is state of the art, our facilities are clean and comfortable, and our professional staff are highly trained. Our veterinarians are members of the American Veterinary Medical Association, and Virginia Veterinary Medical Association. Our veterinary technicians and veterinarians are members of the Virginia Association of Licensed Veterinary Technicians. We partner with Dr. William Olkowski of Cedarcrest Animal Clinic to provide our avian guests the highest quality specialty care. The Katie McCauley Fund was established to cover care for stray or wild animals brought in by Good Samaritans, and is named for the beloved pet of Mr. and Mrs. Melvin McCauley, who provided the fund’s initial contribution. It is our commitment to continue the intentions of the fund by gathering contributions through fundraising efforts and through the generosity of our community. Contact us to learn how you can support the fund or to learn more. VETSS routinely accepts injured wildlife in the region and is proud to work with the Wildlife Center of Virginia to care for those animals. We also work with regional animal control agencies in the counties of Albemarle, Madison, Greene, Culpeper, Orange, Louisa, and Fluvanna. 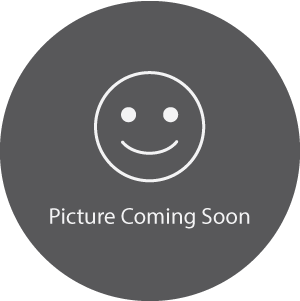 Dr. McKenna grew up on a horse and cattle farm in Charlottesville, Virginia. He wanted to be a vet from an early age, and worked as an assistant at several local practices throughout high school and undergrad. He went to Virginia Tech, and earned a bachelor’s degree in Animal and Poultry Sciences. However, Dr. McKenna took a short break from veterinary work after graduating to help research breast and prostate cancers in humans at the University of Virginia. After several years on the lab bench, he attended St. George’s University to complete his childhood dream, receiving his Doctor of Veterinary Medicine. Dr. McKenna returned to the Charlottesville area and is happy to be home. His professional interests include radiology and canine medicine. He and his wife Jenna live in Earlysville with three dogs: An akita named Rogue; a Belgian shepherd named Houston; and a boerboel named Nala. Their family also includes two cats, several muscovy ducks, and far too many chickens. In his free time, he helps his dad run the family farm, managing sheep, horses, and chickens. Dr. McKenna is an avid hiker and outdoorsman, and he also enjoys playing billiards. Another Charlottesville native, Dr. Miller received a bachelor’s degree in Russian history and French from the University of Virginia. 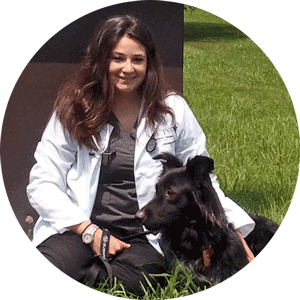 After graduating, she pivoted from the humanities into animal care, attending the Virginia-Maryland Regional College of Veterinary Medicine for her Doctor of Veterinary Medicine. After an internship in Boulder, Colorado, she moved back to Virginia. In Harrisonburg, she worked for nonprofit Anicira Veterinary Center, which offers low-cost, high quality care to patients in need. There, she performed thousands of surgeries and provided important medical care to animals that otherwise would have suffered. Dr. Miller returned to Charlottesville in 2017. She was excited to come home, and especially to work at VETSS, where she was an assistant many years ago. Her clinical interests include veterinary behavior, soft tissue surgery, geriatrics and dentistry. In her free time, Dr. Miller enjoys hiking, art and reading along with her human and furry family. 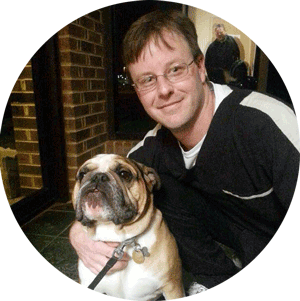 Dr. Oliver grew up in the small town of Eupora, Mississippi, and attended Delta State University. There, Dr. Oliver developed a love for veterinary care while volunteering at the community animal shelter. She turned that love into a professional goal by working at veterinary clinics during school breaks. After graduating with a dual bachelor’s degree in Biology and Chemistry, she attended Mississippi State University, where she received her DVM in 2014. 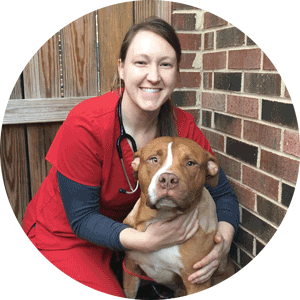 Her first veterinary job was in Huntsville, Alabama, where she worked in emergency medicine. In 2016, she brought her skills, passion, and talent to Virginia. Her professional interests include soft tissue surgery, wound and laceration repair, and geriatric care. In her spare time, Dr. Oliver enjoys spending time outdoors with her dogs Lefty and Coach, cooking, gardening, playing sports, and traveling. Dr. Garza hails from the Lone Star State. She grew up in Dallas, and got her undergraduate degree at the University of Texas campus there in 2009. After, she attended Texas A&M in College Station, where she received her DVM in 2013. She has been at VETSS since November 2018. She is a USDA-accredited veterinarian, with interests in dentistry, emergency medicine, and feline medicine. Dr. Garza is also a certified Fear-Free Professional, which makes her the perfect care provider for animals prone to stress or anxiety. Her favorite animals to care for are dogs, cats, and small pocket pets. When not at work, she enjoys reading, listening to music, cooking, swimming, and watching movies. She also loves to spend time with her family and friends. 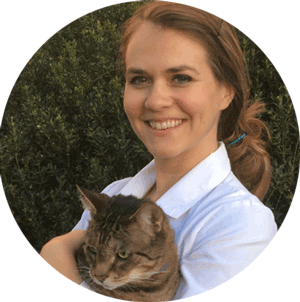 Born and raised in Northern Virginia, Kate has worked in veterinary practices since she was 16. She made her way to the Shenandoah Valley by way of James Madison University, where she earned a bachelor’s degree in business with a concentration in management and human resources. Soon after graduating, Kate realized a desk job wasn’t her calling. She enrolled in Blue Ridge Community College’s vet tech program, graduating in 2006. She first worked in general practice, but prefers specialized practices such as non-profit spay/neuter, and emergency medicine. Kate enjoys kayaking, hiking, traveling, and new adventures. She lives in Weyers Cave with her husband, two stepsons, a rescue pit bull named Bo Jackson, cat named Bratt Favre, and a newly added kitten, nicknamed Kitten. 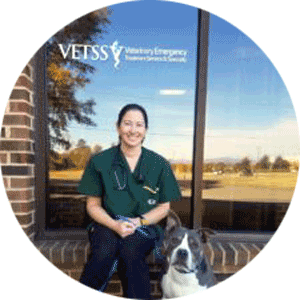 Kelly has been with VETSS family since 2013, and has been a veterinary technician since 2018, when she received her license from Blue Ridge Community College. In her spare time, she volunteers with local rescues, runs a hobby farm, and enjoys gardening, camping, and kayaking. 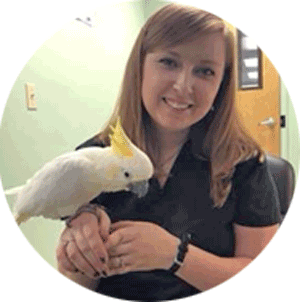 Kelly has a special place in her heart for special needs animals and has found her niche in emergency medicine, exotics, and behavior. Rachel has loved animals all her life, and has worked in veterinary clinics for more than ten years. In 2016 she graduated from Blue Ridge Community College and became a licensed veterinary technician. She strongly believes in her calling to provide compassionate care for all animals. Her professional interests include dermatology, behavior, and emergency medicine. Rachel lives in Staunton with her partner Taryn, two dogs, and three cats. She plans to get a few guinea fowl in the near future. Originally from Johnstown, Pennsylvania, Kayla has carried a love for animals in her blood ever since childhood. 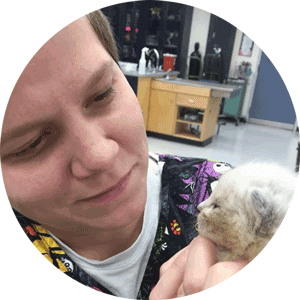 In December 2017, she turned that passion into practice by graduating from the Pittsburgh Veterinary Technician Institute with an associate degree. She joined VETSS in January 2019. Her main professional interests are a tie between dental care and exotic medicine. Kayla’s animal family includes a sweet kitten named Lily, a rat named Cardi, and a gargoyle gecko named Opal. When not at work, she loves to travel and attend live music concerts. Debbie is a native Virginian and has lived in the Charlottesville area for 23 years. She’s always had a passion for animals, and after a 12-year career in real estate she enthusiastically accepted an offer to join VETTS as a receptionist. Debbie and her husband Rob have two grown children and three grandchildren. They’ve filled their empty nest with animals: Three dogs, named Gunner, Pippen, and Yoshi; two barn cats named Luke & Han; a Thoroughbred mare named Magic; and a Quarter horse named Cody. When not at work, Debbie takes advantage of every opportunity to enjoy family gatherings. And, although having such a large animal family makes it difficult to get away, they also love to travel. They have recently acquired a travel trailer and are becoming camping enthusiasts. Luckily, they have found a number of lovely campgrounds within an hour or so of Charlottesville! 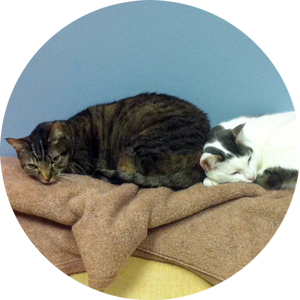 Fiona and Isabelle are a pair of cats who live at VETSS. They patrol the entire top floor and are often heard tearing around on mysterious feline missions. They also help with our emergency care, by providing life saving blood for critical patients at any time of day!! When not on patrol, Isabelle prefers to stake out the couch in the staff lounge while Fiona prefers window sills and high perches. We proudly provide daily wellness care and 24/7 emergency services to the Charlottesville community from our conveniently-located offices on 1540 Airport Road. We've answered some of the more common questions we receive about our veterinary practice below. Feel free to contact us if you would like more information or do not see your question answered here. Q: Which payment options are available to customers? A: For your convenience, we accept Cash, Visa, MasterCard, Discover, and CareCredit. Payment is due at the time services are rendered. Click here to learn more about our complete payment policy. A Payment Plan may be established with CareCredit to allow you to create the easiest payment option for your budget. Care Credit has an automatic 6-month NO INTEREST Plan available, as well as other plans. Care Credit can also be used with many (human) medical service providers. For financing approval, visit the Care Credit website. We also provide the necessary documentation to help clients file pet insurance. For more information, contact us. Q: Which types of pets do you see? A: We see most types of small companion animals and exotic pets! Along with our dog and cat friends, we also see ferrets, rabbits, guinea pigs, potbelly pigs, chinchillas, hedgehogs, rats, mice, gerbils, hamsters, snakes (non-venomous only), sugar gliders, iguanas, monitors, turtles.... and more! We also see some farm animals, including chicken, geese, turkeys, and goats. For bird care, we partner with CEDARCREST Animal Clinic home of Dr. William Olkowski, a nationally-recognized avian specialist. For more information on the pets we care for, see our services. Q: Which types of pets do you NOT see? We would love to help every creature in need, but don't have the facilities to care for large farm animals, like horses and cows. For more information about the pets we care for, see our services. Q: Does my pet need an appointment? A: For non-emergency problems, a scheduled appointment will allow you and your pet the opportunity to share your concerns with the veterinarian and hospital medical team. We accommodate walk-ins on a first come first serve basis during business hours on Monday through Saturday. Additional fees apply. Emergency cases are seen immediately 24 hours a day, 7 days a week.